What is a “proper” polonaise? It’s not a Robe à l’Anglaise with the skirt pulled up. 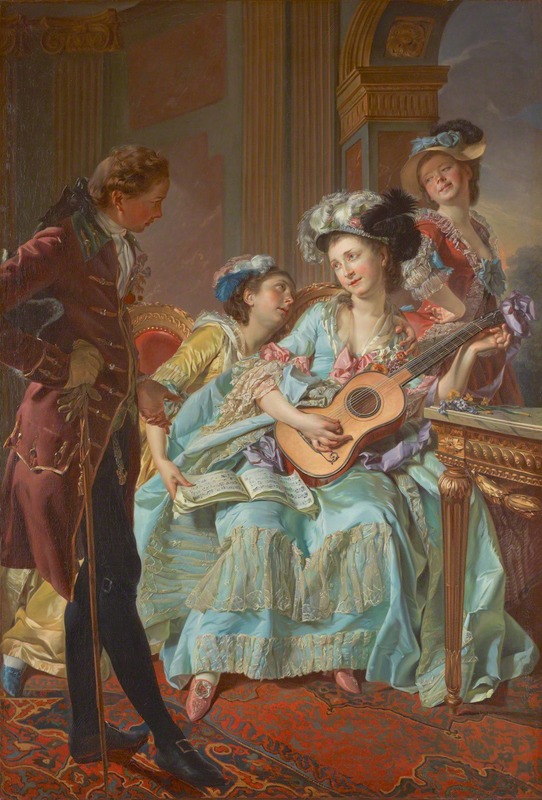 It’s a gown that (judging by paintings and fashion illustrations) was incredibly popular in the 1770s and 80s (but for some reason there are very few surviving polonaises in museums) . 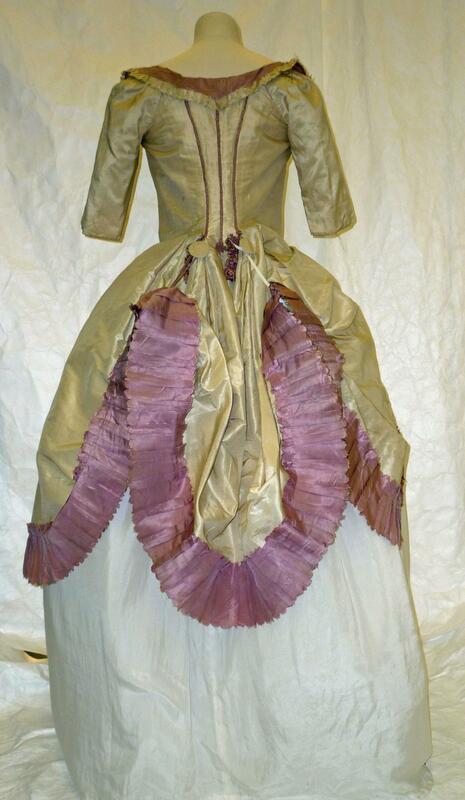 Its front is open, there is no waist seam, so the robe kind of gapes in a V-shape open over a stomacher. And its skirt/robe is looped up, usually so high that you can see a lot of the back of the petticoat. This particular polonaise from a museum in Marseilles demonstrates its characteristic pretty well, as well being one of the few existing museum’s pieces that is actually complete and doesn’t have to rely on reconstructed stomachers and the like. Please note that the trim covers the entire hem of the robe, even the parts that are pulled up. I took this to mean that my trim would also need to cover the whole hem. 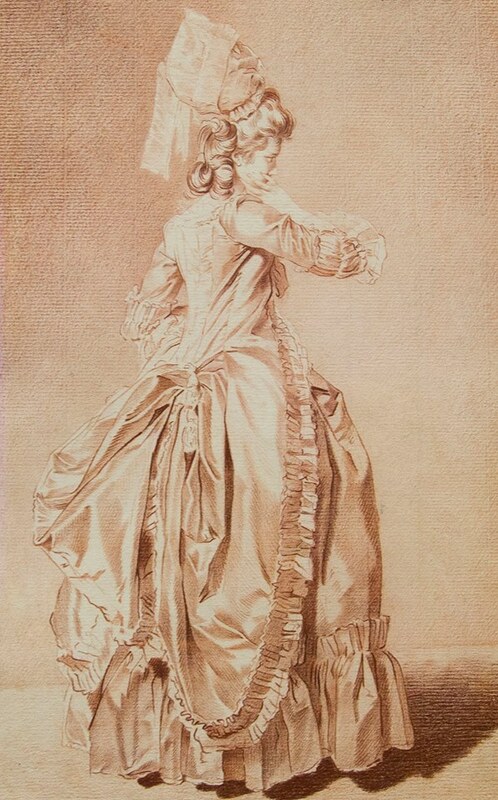 The overskirt looks very long which is utterly consistent with Trinquesse’s other portrayed Polonaises – which are very long indeed. Yet compared to the gown in the V&A that Norah Waugh made a pattern of (and other extant polonaises) it is “unusually” long. The material in the painting is a very shiny silk satin. 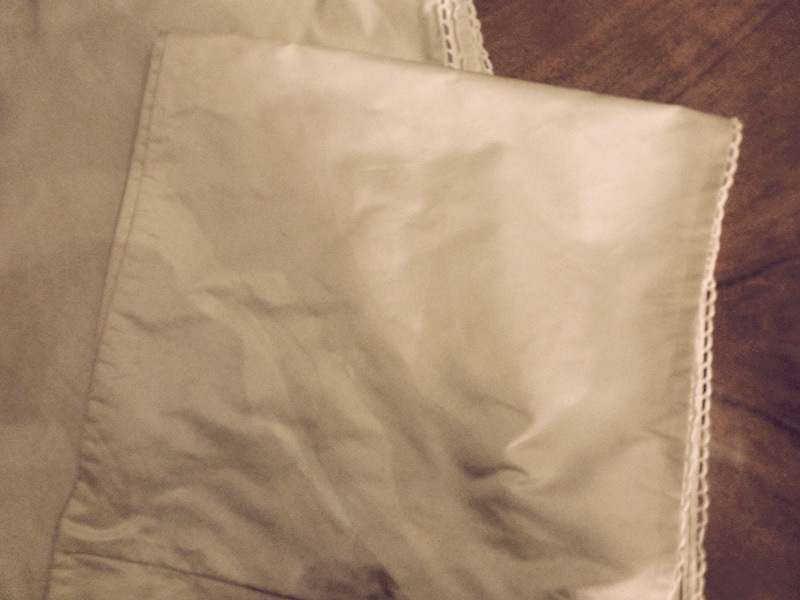 I originally wanted to used silk taffeta in gray/silver but then I came across the most fabulous Silk Duchesse Satin for an unbeatable price that I couldn’t resist. The color is too warm, the painting’s satin is gray but yeah… unbeatable price. It was the worst of all worlds: the pinking machine doesn’t pink and then the trim rolls up. Yep, the material is so stiff, the petticoat stands on its own. Figuring out this part was actually quite difficult. Basically I had to guess what’s going on with the self-fabric trim on the robe and sleeves. It appears to lay flat on neckline but doesn’t just gain width but also volume on the bottom half. The sleeves trim also has some volume. All of the trim appears to have a pinked “scallops within scallops” edge. The latter fact was in combination with the material (remember it can only be pinked along the warp and I had to pink it by hand with pinking scissors) a nightmare. And since these voluminous pleats take up quite some material this came down to marking, pinking, fray checking 16 meters/20 yards of fabric. Fun was not had. After this there was another long, pain-staking process: The trim at the neckline and the upper front was pleated on the gown after I calculated very exactly at which length its width needed to widen and narrow. The trim on the sleeve and the bottom robe was pleated first, then filled with the silk leftover from the pinking and (once that ran out) sheep wool and was then attached to the gown. Again I had to guess what is going on here. But to me neither edge of the trim look pinked. Both looked hemmed to me, only the bottom trim had a thin scallopped lace at the bottom. Also the trim isn’t very generously pleated. I got cotton lace from the only place online that had vaguely the right thing and then applied it to a trim that was 2.5 – 3 times (It’s one of the two but I forgotten which one) the width of the petticoat. 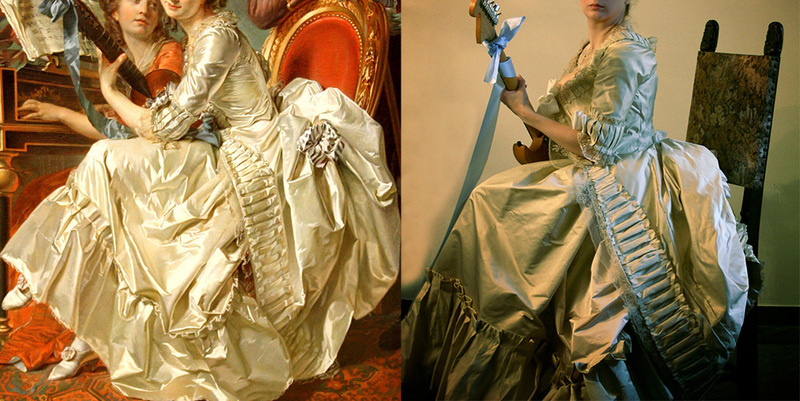 Then I guesstimate at which height of the trim is pleated/sown to the petticoat in the painting and pleated the thing directly on the petticoat. Then I dealt with my least favorite part of this project. I needed some really specific silk ribbon to match the painting: around 2 inches/5 cm wide, with three white stripes and four dark stripes, a white picot edge and with the approximate stiffness of silk taffeta. 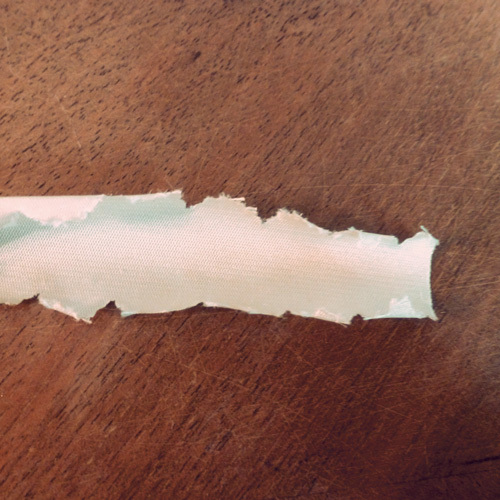 I tried a bunch of things for nearly a year, like shopping for antique/vintage ribbon (Ha! ), buying white silk ribbon and trying to paint the stripes on with two different techniques (Haha!) and searching some more for ribbon. I spotted the “right” ribbon in rayon but that was a bridge too far. So plain white silk ribbon it was. The other challenge was that (aside from the big bow at the back of the robe) all other bows were either entirely invisible or only half-visible (sleeve bows), leaving me to guess their look. Also invisible was the tie that was looped the robe up. I decided to make the tie out of my main fabric. I sewed a tunnel and then turned it over, using raw force to accomplish this because the tunnel was half an inch (1.2 cm) wide and a yard long. The small bow in the back was inspired by a bow that is on a very heavily altered robe in the V&A which I believe to be an ex-polonaise. Okay, full disclosure: this is the part of the gown gave me a bit of headache and might not even stay a permanent feature. 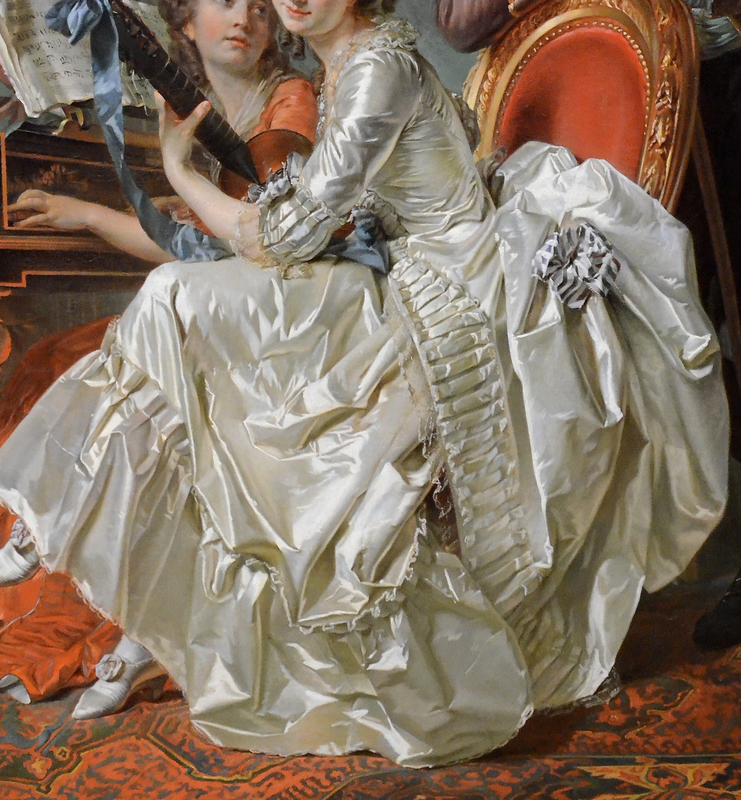 First of all, the painting is good but unlike other materials guessing the type of lace used in a painting is really problematic because hardly any 18th century painter is that detailed. Based on close examination I guess it would be most likely a sort of fine but not overly decorated needle lace like a late 18th century Alençon lace. The problem with actual 18th century Alençon lace is that the only thing that absolutely looks like it is 18th century Alençon lace. So, no. I own some 18th century Alençon lace that absolutely matches this look but I didn’t even think about it long enough to figure out if I own enough of it. But I also own a lot of 19th century Point Applique lace. (Basically lace applied on top of machine made lace net.) It also looks very see-through and is similar enough that the only chance of telling the difference would require a lace expert invading my personal bubble. I covered the part of the lace that would be in contact with my body and sown onto the dress with cotton and then applied the half-covered lace to the neckline and sleeves. (The lace at the front, I pinned on badly for the guitar comparison picture and then took it off.) I still consider taking the rest of lace off as well because it’s a beautiful antique. But maybe I wear at least once before I do that. That is fabulous! Don’t beat yourself up about trying to figure out the dress in the portrait; I once took a class that looked at reality vs. fantasy in portraiture. The lecturer was from the Smithsonian and really believed that many portraits were fantasy clothing rather than what the sitter was actually wearing. You did a fantastic interpretation and it looks divine.